It is great if you can get one of these beautiful fish in the juvenile stage. They are so ornate when they are young, and they do well in tank life. 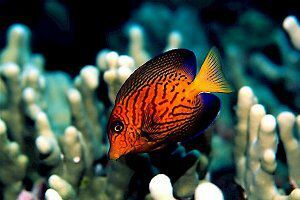 Be aware that chevron tangs will lose their juvenile colors as they grow into adults and become much larger. As an adult, it is still a nice looking fish, as well as a good algae eater. The distribution of this fish extends from Hawaii southeastward to eastern Polynesia, southward to central Polynesia, westward to the Marianas Islands, and doubtless to many other adjoining areas. The adults inhabit the shallower oxygen enriched waters close to the surge zone of the reef where rocks and crevices are found, often collecting in schools. The juveniles prefer the deeper, finger coral inhabited waters and live singly. The juvenile stage of the chevron tang is very colorful with deep purple, orange, and red marking. In captivity, the chevron tang seems to retain its juvenile colors for quite a while longer than it seems to in the wild. There are several cases where the chevron retained its juvenile colors for more than three years, whereas in the wild, the chevron seems to shift to its adult colors after a year. Once in the adult stage, the red and purple colors fade and the coloring becomes dark brown, almost black, with the sides of the body and head marked by many fine, horizontal, yellowish-gray lines. Because the adult stage of the chevron tang is similar in appearance to that of a ​kole (yellow-eye surgeonfish) tang, it is sometimes referred to as the Hawaiian black kole. The differences are that it does not have the yellow ring around the eye, the body is darker in color, and its pectoral fins turn a dark brown color, where the kole's pectoral fins are almost transparent. This is not an overly aggressive fish, so it may get picked on by more aggressive surgeonfish. It will usually get along well with other tank inhabitants, with the exception of its own kind, and it rarely bothers immobile invertebrates. Its diet makes it a great complementary companion for other peaceful surgeonfish such as the yellow tang or the Pacific sailfin tang, though you need to keep an eye on compatibility. In the wild, a cleaner wrasse would normally keep a tang parasite free. Alternatively, you can add neon gobies or cleaner shrimp to your home tank to help them remove parasites that might crop up. The minimum aquarium size suggested for this fish is at least 135 gallons. It is a big swimmer and needs a lot of space. Being among the smallest and least active of the surgeonfish, you would think a smaller aquarium would suit it, but it needs a lot of space for algae to grow and for them to harvest on their own. They need plenty of naturally grown algae and accumulated detritus. To meet their dietary needs they will need a large aquarium with lots of live rock. They will benefit even more with the inclusion of live sand. They use their teeth to lift and sift through various types of rocks, sand, and other surfaces and use their mouths to vacuum up the algae. In the aquarium, you will often see little lip marks on the glass where algae used to be. They are susceptible to bacteria resulting from organic buildup which deteriorates water quality. They will need vigorous filtration, protein skimming, and regular small water changes. Although this fish is a herbivore in the wild, with its main diet consisting of marine microalgae growth, you can also feed it shrimp and other meaty foods in captivity. The majority of their intake will be vegetable matter. The chevron tang is excellent for keeping the brown (diatom) algae and green hair algae in check in your aquarium. This fish is sometimes called a bristletooth tang due to its nature of feeding. They use bristle-like teeth to eat detritus which contains minute algae rather than the filamentous algae eaten by other tangs. The Ctenochaetus species, referred to as both the bristletooth or combtooth tangs, have several rows of small flexible comb-like teeth (up to 30 teeth) along with a protrusive pouting mouth. Provide lots of marine algae, prepared frozen formulas containing algae or spirulina, frozen brine and mysid shrimp, and flake foods. Use a vegetable clip to adhere Japanese nori seaweed to the aquarium glass. Feed three times a day in smaller amounts instead of a large quantity once a day. As continuous grazers, they will benefit from this. This will also keep the water quality better over a longer period of time. This species does not seem to have any unique identifying characteristics between the sexes. Males will assume brighter courtship colors during mating periods. The chevron tang, like other surgeonfish, is pelagic, meaning it's a free-spawner or egg-scatterer that spawns in groups. The female ejects her small eggs in the water column after which the male swims over and through the egg cloud fertilizing as he goes. The female produces hundreds of eggs at a time a number of times per year, usually in the spring and summer months. The clear, fertilized eggs float to the surface and join the stream of plankton where the larva feed and develop into miniature adults.